Since it's almost the end of the season for our family garden, I figured now would be a good time to share an update on how it's been going. Let me first start by saying that Piper has loved being in our family garden ever since she first stepped her bare feet in it, last year (gasp at those baby wrist rolls, they make my heart skip a beat, they are so cute). She was only about 5 months old at the time, but we knew she was going to love what came from the soil beneath her toes. Fast forward to the present, and a lot has changed in a little over a year. 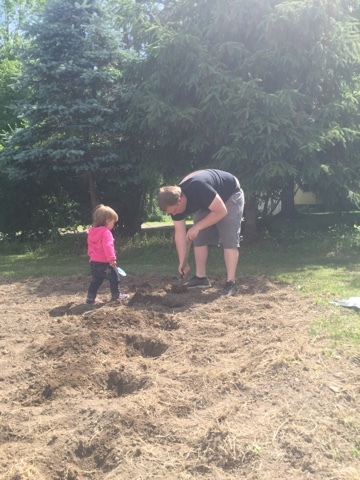 This is Piper's second year "helping" out with our family garden and we can't keep her out of it! What started at the beginning of the summer as just playing in the dirt and "smelling" all the of plants, has turned into something more. 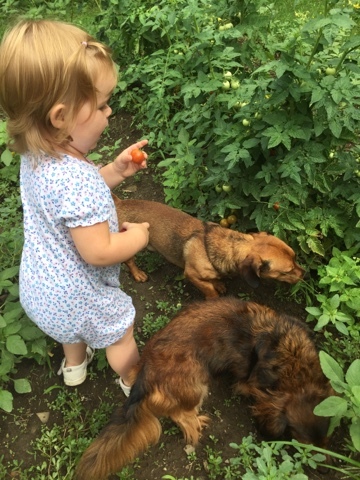 Now, Piper can pick out a ripe tomato faster than I can some days. She'll get down on all fours and dig deep into the tomato plants to find any chance of an orange cherry tomato, ready for the picking. 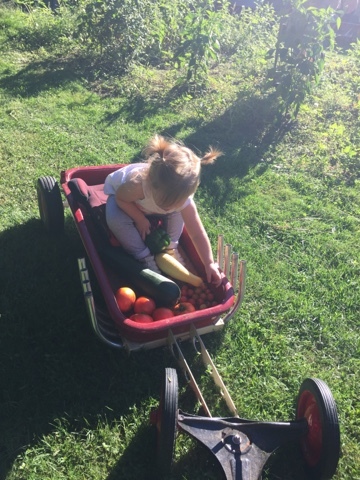 While she does pick some green ones from time to time, she knows that the orange/red ones taste the best! Keeping a family garden is important to me. It's something that both Nick and I want Piper to grow up with and learning all about. Piper has already learned a lot this year, and at first she learned with very little guidance from us. 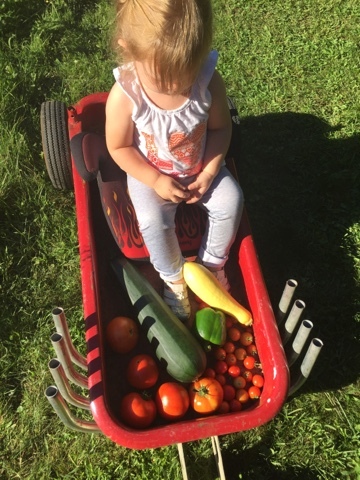 Almost instinctively, Piper picked her very first "balls" (tomatoes) on her own in July, and she even picked the ones that were ripe. While at first, Piper was referring to cherry tomatoes as "balls" (because that's what they look like), overtime she has learned that they are tomatoes and will call them "matoes", too. This year in our garden, we planted a few different vegetables. We planted cherry tomatoes, heirloom tomatoes, cucumbers, green peppers, summer squash and zucchini. It's fair to say that the cherry tomato plants are Piper's favorite plants this year (they're the only vegetable that tastes well right off the vine). Even so, she has begun looking through our squash and zucchini plants for some produce, as well. I think she looks there mostly because she likes the reaction we give her when she comes to us with a big ripe zucchini in her hands. She doesn't know what it is, but she knows we get happy to see them. Zucchini is my favorite vegetable from the garden, after all. 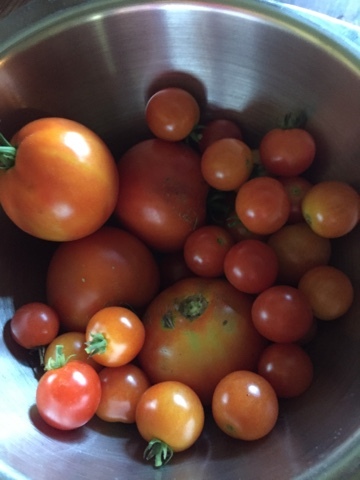 August was a wonderful month for our garden. It seemed to produce vegetables at the perfect rate for us to consume them. 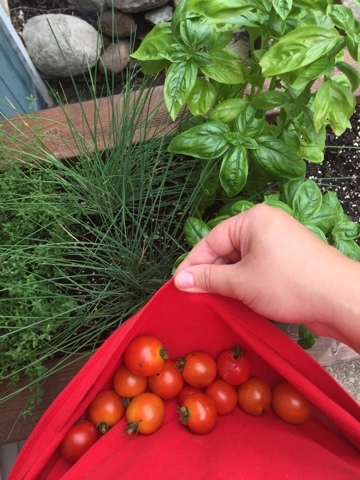 Now, it's the beginning of September and we're in the season where our vegetable garden is producing wildly. 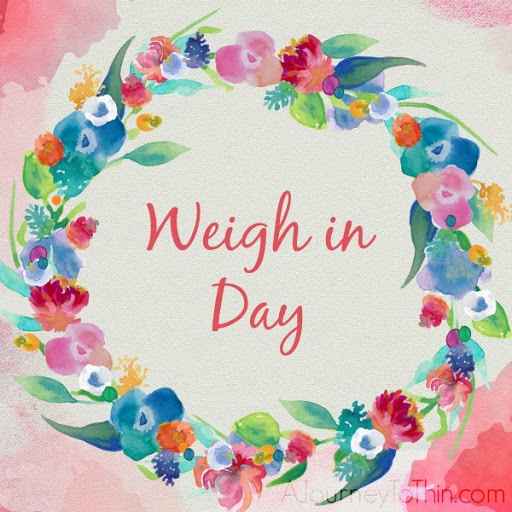 We are picking produce out by the wagon-full every day. Piper is in heaven, she loves it so much! 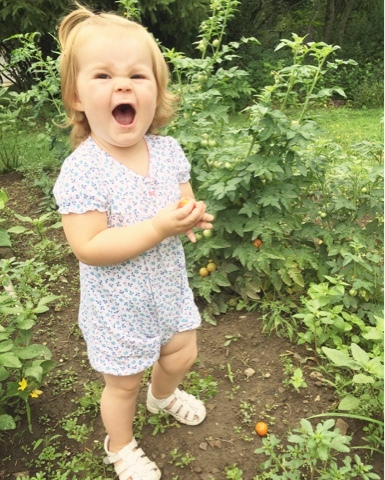 Nothing brings more joy to me than seeing Piper grow up, loving vegetables and learning how to grow them. 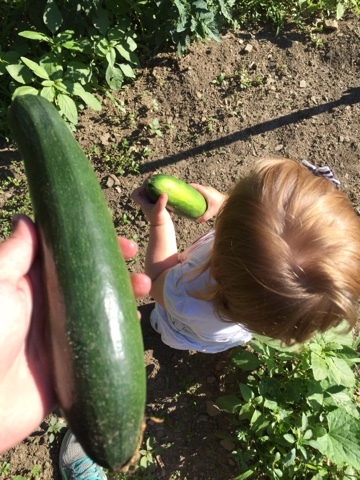 I think we're in for many years of fun in our family garden with her.